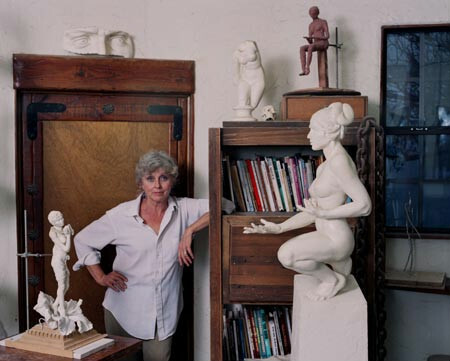 Linda Elder was first introduced to her favorite art form when an art teacher in high school allowed her to do sculpture in the back of the class while the rest of the class worked on drawing projects. But she didn’t return to explore art again until after her three sons started grammar school, and she entered college a second time – the first time she had studied oceanography. After extensive study and work in painting and drawing, she found two-dimensionality too limiting, and by chance rediscovered the area of sculpture. The three-dimensional and multi media options available to sculptors were far more challenging and in complete harmony with her own sensibilities. Linda Elder’s documentation took place in 1999. The FOTM Archive contains extensive information about this artist.